Whack-a-mole, that’s what it is. The second I get one catastrophe taken care of, boing, up pops another. Bigger. Meaner. And more destructive. This is monotonous, ladies and gentlemen. My arms are tired from the whacking and pounding. I need a break. Remember that second part-time job I got? The one that means I can eat twice a day now? Well, guess what. Rumor has it they’re going to close the office. Gah! Why do I even get out of bed in the morning, right? There’s one very simple, very compelling reason: to escape the screeching and snapping and splintering from my upstairs neighbor and her long-suffering recliner. Oy. Shoot me now. I’m begging you. I’m pretty sure life is just a “Wack-A-Mole” game on a large scale. I think a better choice would be to shoot the neighbor. Just kidding. You’ve no idea how often that thought crosses my mind, Len. I’ve also thought about restraints and/or pushing her out a window. I don’t think she’d fit, but I’d like to try. 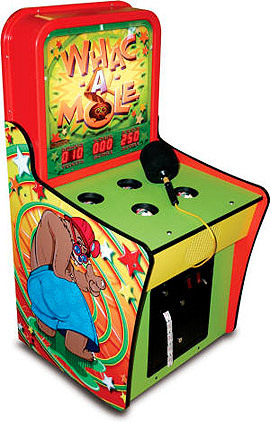 The “Wack-A-Mole” is a really good analogy for life. At least for most people. Mine for sure…and apparently yours. Sorry there will be no shooting. I like your company. I bought a can of tennis balls, silk purse. Now when the noise starts I launch one at the ceiling. It’s fun and effective. I’ve gotten sleep 2 nights in a row. Yay!